Last spring, when Capcom released the first trailer for Resident Evil 5, message board posters erupted with the usual internet man-child commentary: "Resident Evil 5 FTW," "I gotz to haves this game," etc. That is, until Level Up's N'Gai Croal posted some poignant thoughts discussing the racially charged imagery from Resident Evil 5 trailer and what it meant to him as a black gamer. His comments were both sharp and inspired, so like most thought-provoking commentary on the internet it was ridiculed mercilessly. Yet seeing the race issue of Resident Evil 5 unfold has shown that, given enough time, any group can become socially conscious - even gamers. This may come as a shock if you have ever braved the racially hostile waters of Xbox Live, but games in general have become more culturally sensitive in the last couple of years. That's not to say stereotypes in gaming have been eradicated, but they're not nearly as rampant. Don't believe me? Take a look at most videogames from the 1980s. Games from that era were riddled with stereotypes that internet protest groups would never stand for today. 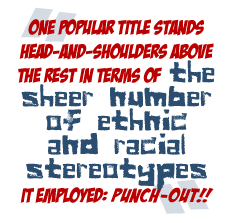 But one popular title stands head-and-shoulders above the rest in terms of the sheer number of ethnic and racial stereotypes it employed: Punch-Out!! for the NES. I spent way too much time playing Punch-Out!! in my childhood. From the countless hours of studying the intricacies of Bald Bull's attack to repeatedly beating up Glass Joe just to feed my minor superiority complex, Punch-Out!! was the game that made me fall in love with videogames. But I'm not here to reminisce. When I take off those nostalgia-tinted glasses and put on my 21st-century, culturally sensitivity binoculars, Punch-Out!! looks quite different. Soda Popinski, the U.S.S.R.'s contribution to Punch-Out!! 's roster, doesn't look so innocent anymore when you realize that soda bottle looks more like a bottle of vodka the more times you glance at it. Likewise, the Japanese boxer Piston Honda's random outbursts of Japanese words - like "sushi" and "kamikaze" - between bouts isn't as harmless as it once seemed. I love Punch-Out! !, but it's riddled with stereotypes. Every character in the game other than Little Mac has a negative stereotype associated with him. The list goes on: The first opponent you face is a French boxer called Glass Joe, the weakest fighter in the game with a 1-99 record. He constantly makes cowardly statements like "Make it quick ... I want to retire," which reinforces many stereotypes about the French. Then there's Spain's Don Flamenco. While not as pathetic as Glass Joe, Don Flamenco radiates an effeminate "pretty boy" persona by making constant references to his perfect hair and starting off each fight with a feisty Latin dance. This was how Spain's rich European culture appeared to many Americans in the 1980s.